In the city of Shadow, beneath the World Tree, alleyways shimmer with magic and godlings live hidden among mortalkind. Oree Shoth, a blind artist, takes in a strange homeless man on an impulse. This act of kindness engulfs Oree in a nightmarish conspiracy. Someone, somehow, is murdering godlings, leaving their desecrated bodies all over the city. And Oree’s guest is at the heart of it. . . Sometimes I try to associate authors with one word that, I feel, describes their writing style. For example, Stephen Erikson’s word, in my mind, is deep. Jacequeline Carey would be eloquent. N.K. Jemisin would be passionate. And that’s, honestly, the word I would also use to sum up the book as a whole. 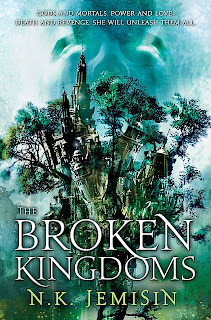 The Broken Kingdoms made me realize that if there’s one thing Jemisin excels at, it’s infusing her work with a passion that burns from the first page to the last. Yeine takes a backseat in this book and Oree is our new, blind protagonist. While I was, at first, rather leery and skeptical of how good a book would be with a blind protagonist, Jemisin takes that disability and makes her book soar with it. The world seemed so much more vibrant and real than I expected. It is obvious that Jemisin really took time exploring the world the way a blind woman would. The Broken Kingdoms expands on the world and history quite a bit more than The Hundred Thousand Kingdoms did. Perhaps this is because the book takes place ten years after its predecessor so the world has had time to shift and alter a bit after the events in The Hundred Thousand Kingdoms. Because of this lapse in time and the alterations in the world as a whole, the book is different enough from it’s predecessor that it almost seems like a stand alone, though I would recommend readers read The Hundred Thousand Kingdoms for more of a background and foundation before reading this one. Oree is an interesting protagonist. After the first few pages of the book it’s easy for the reader to become attached to her. Her interesting abilities add more color, depth and mystery to her as a whole. There are some repeat players from the previous book that show up briefly in The Broken Kingdoms, but by and large the cast and crew is new, which gives the book a fresh air that it might have lacked if old characters had carried over in larger roles. The plot is quickly moving. The overarching sequence of events that lead to the main mystery happen quiet quickly and from that point on things seem to move forward at a breakneck pace. This is, however, where my only real problem with the book should be mentioned. There were points where the facts were so obvious, so boldly stated almost to the point of hitting the reader over the head with them that Oree’s inability to figure out what everything meant was unbelievable to me. Toward the second half of the book this became more apparent and slightly frustrating, but nothing so dramatic as to hinder my enjoyment of the work as a whole. This book is intensely character driven. Jemisin does a good job at adding an additional layer of depth, believability and color to her world, which is necessary, but even that seems to take a backseat to Oree’s story. The passionate, interesting perspective of Oree really made the book what it was. Personally, I felt Oree was a more interesting character than Yeine, though there were points of disbelief with Oree which were mildly frustrating at times. There are some great action scenes in The Broken Kingdoms, some wonderful villains which reminded me of certain groups in our own world. Its filled with human-like gods and plenty of secrets and hidden agendas to keep anyone satisfied, all topped with a delicious dollop of Jemisin’s passionate prose. Jemisin’s take on gods and godlings is nothing beyond fascinating. Their humanity is compelling and thought provoking and they add great spice to the work as a whole. Fans of The Hundred Thousand Kingdoms will probably enjoy this book even more. It’s well done, clean and concise with wonderful prose and a tightly woven plot. There’s romance, fantasy, crime and mystery. A little something for everyone. To summarize, engrossing characters, a passionate protagonist, a unique world and a quickly moving, gripping plot all combine to make The Broken Kingdoms a huge success. Oree, a disabled woman who often seems more divine than the gods who surround her is what makes this book fantastic, compelling and fresh. If, at times, her understanding of events was frustrating, it’s easy to overlook as Jemisin’s plot and prose quickly sweep the reader away. Jemisin has arrived in style and proven that she’s an author to watch out for. I should start reading this author. Would you recommend starting with The Hundred Thousand Kingdoms or her short stories? I've never read any of her short stories. I started with The Hundred Thousand Kingdoms. I think most people have, so that's probably a good starting point.